The boy who took Edward Field’s place in the water and gave Edward his place in the life raft after the ditching of their B-17 The Challenger in the North Sea on February 3, 1945 was Jack Coleman Cook. His name was Jack C. Cook. 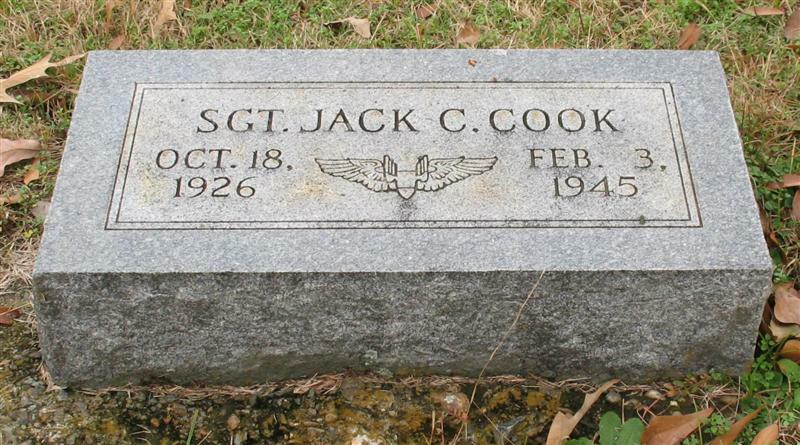 His Army Air Force serial number was 38601019, which matches the personnel record for the 384th Bomb Group’s Jack Cook. He enlisted in WWII on December 10, 1943 in Little Rock, Arkansas. He was a resident of Garland County, Arkansas (Hot Springs). He was born in Tennessee in 1925. He had 1 year of high school. His civilian occupation was “skilled mechanics and repairmen, motor vehicles,” which leads me to believe that before enlistment he worked for his father at Prince Cook Motors. He was single when he enlisted. He was assigned to the Robert Clay Long crew of the 546th Bombardment Squadron (Heavy), per AAF Station 106 (Grafton Underwood) Special Orders #8 dated 9 January 1945. He served with the 384th Bomb Group on three missions as a ball turret gunner. He died on February 3, 1945 in the North Sea on his crew’s return from a mission to Berlin aboard the flying fortress, The Challenger. He saved the life of Edward Field by giving Edward his place in the life raft on the mission to Berlin. The crew’s pilot, Robert Clay Long, and radio operator, Frederick Arnold Maki, lost their lives the same day in the North Sea. His parents were William Prince Cook, Sr. and Mary Ellen Cagle Cook. William Prince Cook, Sr. and Mary Ellen Cagle married on March 23, 1933 at the Union Avenue Baptist Church in Memphis, Tennessee, when Jack was around seven years old. 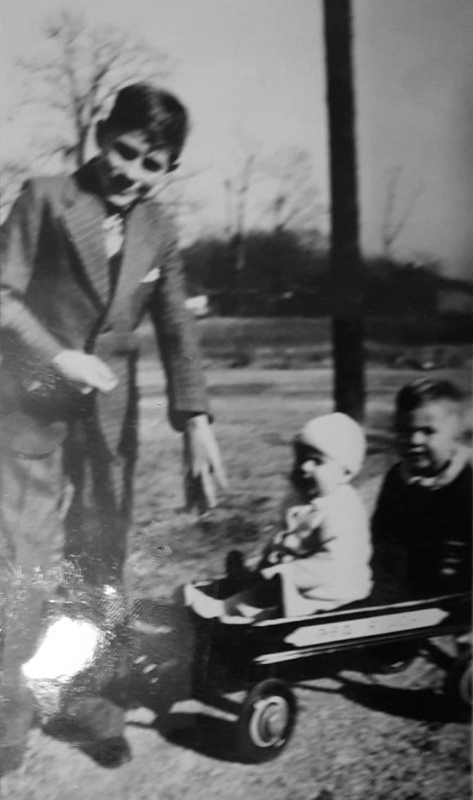 In 1935, the Cook family lived in Memphis, Tennessee. In 1940, the Cook family lived in Hot Springs, Arkansas. He had a younger brother and sister, William Prince, Jr. and Mary Princella. 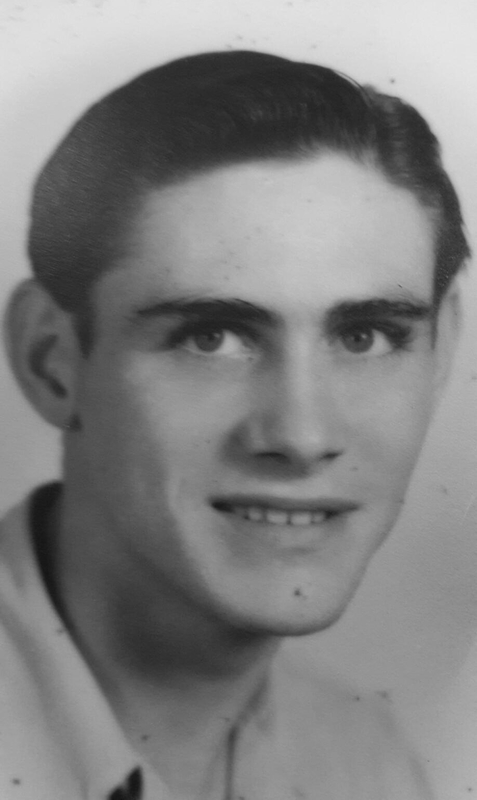 On August 12, 1944, at 18 years old, he married Lucille Hutzell in Hot Springs, Garland County, Arkansas. His birth month and day was October 18, but his birth year is in question. It was either 1925 or 1926. The birth year on Jack’s marker in Hot Spring’s Greenwood Cemetery reads 1926, a date which I must assume was provided by his father. But the birth year on his enlistment and marriage records is 1925. If 1925 is correct, Jack would have been 18 years old when he enlisted, but if 1926 is correct, he would have only been 17 at the time of enlistment and 18 at the time of his death. Those are the only bits of information I knew about Jack Coleman Cook until just a few weeks ago. Last week, I wrote of the recent discovery of some of Jack’s relatives. Jack’s niece, Delia McBride, and great-nephew, Jamie Melton, have given me a glimpse into Jack’s childhood. William Prince Cook and Mary Ellen Cagle met on a blind date. Prince was a car salesman who was already in his late thirties and nine years older than Mary Ellen. He spent his spare time helping out at a church in Memphis. Through his work at the church, he met a young boy, an orphan. The orphan, Jack, would have been around six or seven years old at the time. After Prince and Mary Ellen married in 1933, they adopted Jack. Even though Prince and Mary Ellen were not Jack’s birth parents, they became his loving mother and father and he their beloved son. In February 1945, Mary Ellen heard a knock at the door. Before she opened the door, she knew Jack was gone. The news of Jack’s death confirmed her mother’s intuition and her deepest fear. Mary Ellen and Jack did not share a bloodline or DNA, but a mother’s love for her son transcends all things biological. Family is not made of flesh and bone, but of heart and soul. The Cooks were another family destroyed by a tragedy of war. I was shocked and grieved to read in yesterday’s paper about Jack’s death in action. As I saw the boy’s picture and read the article it brought back a flood of memories and I called Mr. Armstrong today to find out how to get in touch with you. I know there is very little that anybody can say to you, but I want to tell you that I realize what a grand job you did with that boy and know that your sorrow must be tempered with pride that he came through in such a splendid way and was able to give this service to his country. Mrs. Livaudais and I share with you in your sorrow and your pride and we want you to know that we are thinking of you and that it is a real inspiration to us to have known you and to have seen the splendid results of your affection for this boy and your fine sympathetic understanding of him. The Cook family moved to Hot Springs, Arkansas in 1940, seven years after Prince and Mary Ellen adopted Jack. In 1940, they had three children, with the addition of son Prince, Jr. and daughter Princella. Prince Cook, Sr. opened his own Ford car dealership in Hot Springs. Jack Coleman Cook with younger sister Princella and younger brother Prince, Jr. It is unclear if the Church Mission of Help was involved in Jack’s life before his adoption or as he grew up, but it is clear that the people of the Church Mission of Help fondly remembered Jack and Prince Cook for many years afterwards. When the news media told America the story of Jack Coleman Cook and Edward Field, several old newspaper articles about Jack also surfaced. Sergeant Cook was well known here. He came to Hot Springs from Memphis with his parents about five years ago. He attended Gulfport Military Academy and Subiaco Academy. He was a member of the First Baptist Church and his parents are leaders in civic and church work. He had been overseas since December. The Air Medal and the Bronze Star Medal have been awarded posthumously to Sgt. Jack Cook, aged 19, son of Mr. and Mrs. Prince W. Cook, according to information received by Senator J.W. Fulbright from Brig. Gen. Miles Reber, acting chief of the Legislative Liaison Division. Sergeant Cook, ball turret gunner on a B-17, was shot down in action over Germany. When their Fortress crash-landed in the North Sea, one of the life rafts got away. Sergeant Cook “acted as a human propeller,” the citation said, and refused to get on the other rubber float, fearing it would sink. Later he died from exposure. Fellow 384th Bomb Group researcher Keith Ellefson notes that Jack would have also been eligible and his name submitted for award of the Purple Heart at the time that the other recommendations were submitted, even though the article doesn’t mention that medal. Jack’s relatives, Delia and Jamie, confirm that Jack was awarded the Purple Heart. Delia was in possession of her Uncle Jack’s medals until they were stolen from her home in 1995. When war was declared, Cook, not yet 18, volunteered. He went overseas just before Christmas 1944, and was assigned to a flying fortress, The Challenger. Since connecting with Jack Coleman Cook’s niece, Delia Cook McBride, Arkansas Congressman Bruce Westerman’s office is working to replace Jack’s medals and to add Jack’s name to the Veterans Memorial of Garland County in Hot Springs, Arkansas. Just days before Delia discovered that her Uncle Jack had been honored on the floor of the House of Representatives by Congressman Westerman, Delia had visited the Veterans Memorial and thought she should add her Uncle Jack’s name. Now Delia will receive replacements for Jack’s stolen medals and will see him honored at the memorial in his home town of Hot Springs thanks to Arkansas Congressman Bruce Westerman. By thearrowheadclub in 384th Bomb Group on May 23, 2018 .